After the Pomacea diffusa colony was initially discovered on 12/17/2006, this reporter monitored it on a periodic basis for over three years. During that time inconclusive evidence was occasionally seen that suggested the species was being preyed upon by either mammals or birds. Finally during a visit to the Pomacea habitat immediately adjacent to Beach Boulevard between the U. S. post office and the Kentucky Fried Chicken restaurant on 11/1/2008, conclusive evidence was found indicating mammal predation. During that visit a midden of sorts was discovered that contained five P. diffusa specimens to include some that were partially consumed and two that were still alive. All of the specimens were removed from the area. The same location was revisited on 1/6/2009 and two additional P. diffusa were found at the same location including one that was partially consumed and one empty shell. The partially consumed specimen was removed from the area. 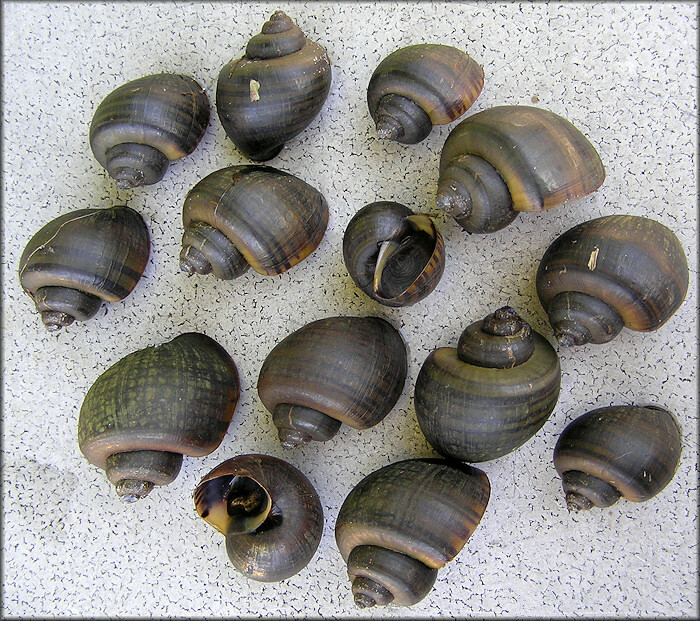 A third visit was made to the same location on 1/18/2009 and eight P. diffusa specimens were found which included the single shell that was not removed from the area on 1/6/2009 and three specimens with the animal/operculum intact. To check for further activity, follow up visits were made to the area on 1/19/2009, 1/20/2009 and 1/21/2009. Although nothing new was observed on the earlier dates, on 1/21/2009 two additional empty P. diffusa shells were present at the midden location. Based upon the well-worn trails in the Pomacea habitat, it is now believed that a small mammal such as possum is responsible for collecting the shells and assembling them in one small area. Below is an image of the site where the Pomacea diffusa were discovered on three different occasions as a result of animal predation. The view is downstream in the ditch and towards the west with Beach Boulevard on the right. A majority of the specimens were found at the location designated by the center arrow. No evidence of Pomacea had previously been found upstream from this point. The sudden appearance of so many Pomacea diffusa specimens in this area, an area where very few specimens had been found previously, suggested that a large living population was present but had gone undetected - except by predators. The area was monitored throughout 2009 and a large number of egg clutches were found there as the egg laying season progressed. 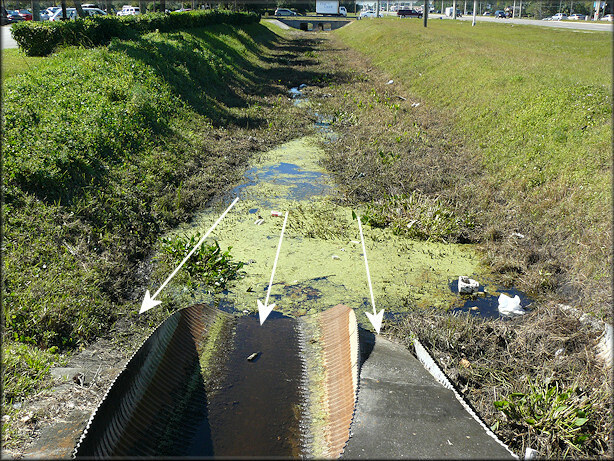 Subsequently on 10/30/2009, three large living probable female specimens were found upstream from the culvert pictured on the previous page. Four scoops below the culvert with a small net on 11/6/2009 yielded the 14 additional living specimens pictured below.